* I'm returning to one of my favourite themes, here, with the incredible story of "Lucknow Kavanagh" - the Mad Irishman who became an unlikely hero of the Indian Mutiny. And one of only five civilians to win the Victoria Cross. It's a small story and a strange one. For some men are born heroes. Some have heroism thrust upon them. And a few, like Henry James Kavanagh, seize heroism by the throat and strangle it until it gives in. Cannon-balls were tearing through the walls of the battered British residency. Outside,some 10,000 rebel native troops of the East India Company were grimly pressing home their attack after five months of siege. On the night of November 9th, 1857, with a fifth of the garrison defending what was left of the British stronghold of Lucknow already dead, one man was preparing to go to war. But first, he needed to complete his fancy-dress outfit. Thomas Henry Kavanagh was about to embark on one of the most unlikely missions in British Military history. And he needed the English officers around him to get over their fits of the giggles. Perhaps it was the strain of the long siege. Maybe it was simply the sight of the grimly determined, six-foot, red-haired civil servant before them in pantomime costume. 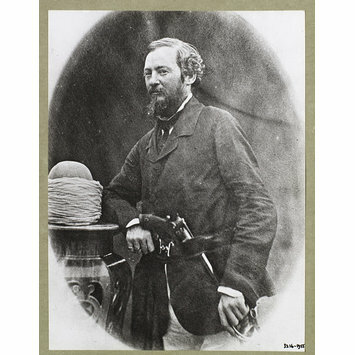 But General Sir James Outram, commanding the defence, could hardly keep a straight face. Some of his subordinates had to leave the room, preferring the risk of being cut in half by a cannon-ball to getting caught, rocking with barely-suppressed laughter. It was Sir James himself who was rubbing boot-polish on the face of a lowly civil servant from Co Westmeath in Ireland. The unlikely hero of the hour, James Kavanagh. Kavanagh stood before him in the lamplight, dressed in "native garb" as a "hindoo peasant", grimy robes and a turban, with boot-polish smeared across his face. In a moment, he would try to get beyond the walls and through the lines of rebel troops to reach the stalled relief column. Nobody in the room really expected to see him again. Henry Kavanagh was 36 and already the father of nine children when the Indian Mutiny broke out. Living with his family in the northern city of Luknow, he had a dull, low-paid job with the Bengal Civil Service and was resigned, as he said later, to a life of “miserable drudgery”. And then came the Mutiny. When the native troops employed by the East India company to subjugate an ancient civilisation rose up in rebellion. And Henry Kavanagh suddenly found himself at the centre of Great Events, besieged inside the British Residency with thousands of Europeans, assailed on all side by the "natives" who had risen up to expel the British. And as it all fell apart about him, as fire, death and destruction swept through the British Raj and the Great Conquerors cowered in their isolated forts, Thomas Kavanagh came alive! What had seemed set to be a life of grey drudgery as a minor clerk in some dusty outpost suddenly became the setting for epic heroism. And Thomas Kavanagh was not about to let his destiny pass him by. Five months into the seige of Lucknow, Kavanagh had been one of its bravest defenders. He had almost had his head taken off by a cannon-ball (the shot burnt his ear), one of his daughters died of dysantry and his wife was shot through the leg. But Kavanagh had never felt so alive, or "glad to be rid of the restraints of civilisation". The grey civil servant had transformed into a technicoloured hero. After four months, hopes rose inside Lucknow when word somehow arrived that a relief force was on the way. But that force's commander, Sir Colin Campbell, faced a serious obstacle. How could his small force find a way through the various bands of mutinous troops around Lucknow without having to fight every inch of the way? One previous attempt had been beaten back with major losses. Without a safe way through the lines, Campbell's Scot's highlanders would face the same fate. It was Kavanagh himself who came up with the answer. He would disguise himself as a native, find his way through the lines and guide the relief force through on the safest and quickest route. Of course, being a six-foot tall, ginger Irishman, he might find it hard to pass himself off as a local. But he convinced the general to let him try, in black-face and improvised costume. Kavanagh would not be put off from his suicide mission. "I sat amazed by my boldness" he recalled of the moment. So off he went into the night, dressed like an extra from an Am-Dram production of The Arabian Nights. On the night of November 9, 1857, accompanied by a very brave Indian courier called Kunooujee Lal, Kavanagh slipped outside the walls of the residence. He was armed only with a double-barrelled pistol, one-shot for himself, one for Lal, if they were cornered. They blundered around in the dark for many hours, barely evaded capture on a number of occasions and finally made it to the British relief force, more by accident than design, shortly after dawn. After getting some reviving brandy and a pair of dry socks, Kavanagh was taken before General Sir Colin Campbell and insisted that the relief column follow him immediately through the safe route to the walls of the British Compound. Campbell's force of Highlanders and Sikhs stole into the city, staged a surprise attack on the besieging forces and saved the day. Lucknow Kavanagh was the hero of the hour! The Indian Mutiny eventually petered out, after terrible revenge attacks on the now-scattered rebels. In 1860, Kavanagh was presented with the Victoria Cross, a very rare distinction for a civilian and was celebrated throughout the Empire. However, with the mutiny over, he slipped slowly back into obscurity. Kavanagh stayed with the British Civil Service oversees and died in Gibraltar in 1882, where he was buried. Perhaps the strangest VC story of all belongs to Lucknow Kavanagh.